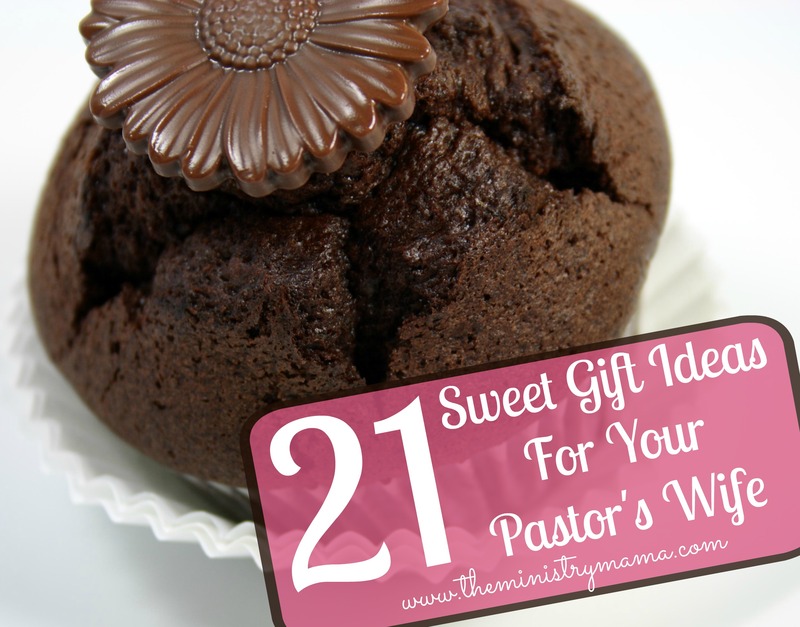 Today’s post is for those who are pastors and pastors’ wives… in my heart of hearts I pray that this will be taken in the spirit of encouragement. If you can name it and it has something to do with the church and its’ members then it can be a stress in the life of you and your family. Any type of stressor can become a burden when you are unsure of how to deal with something… or you are waiting in prayer for God to give you an answer so you can move on in faith. Church life definitely can come with baggage — that type of baggage that makes you want to stay in bed on church days or hide in your office as service times begin. It is not uncommon for unwanted circumstances to come at you in waves and for you to feel inadequately prepared to deal with them in wisdom and a right spirit. We have served beside others or communicated with peers and have seen people we loved keep us from comforting them. We could discern that the weight of the daily in’s and out’s of ministry were bogging them down and causing the spark in their eyes to dim to a depressive state of mind. Yet, for some reason when God brought us as comforters to their door with hands empty and ready to carry some of their load, they slammed the door on us. This left two families with burdened hearts (theirs and ours) instead of a common bond of brother/sisterhood and unity from sharing the weight in their hearts. Allow God to send comforters to you, who will be a blessing. Never assume that the only ministry family that is suffering and bearing the load of life and ministry is the pastor’s family. If you have church staff or you have laymen that are whole-heartedly invested in your ministry then they also carry the burdens of ministry and responsibility of meeting the needs of people on their shoulders. Sin in church members affects them and their hearts too, it can consume their thoughts and prayers also. Others may never know the degree of weight you carry because the accountability of the pastor is greater, but remember responsibilities weigh on each person’s life. A burden is a burden. They may not know all the details of counseling sessions or the diligence required to do all things decently and in order while ministering as a shepherd (or shepherd’s wife). Do not minimize their heart’s burdens as insignificant in comparison especially when their burdens are linked to the same church family as yours. The hands of ministry workers, staff, and volunteers are tied when you separate yourself in a class all of your own and elevate yourself to some level of never being understood because of a position. One person or couple should not be bearing all the burden alone. We are meant to bear one another’s burdens because it fulfills the law of Christ. Christ took all sin of the world upon Himself as He died in our place, He understands the concept of bearing the burdens of others. Church staff in specific situations can often bear a harder burden because of the pressure that is applied from the expectations of the pastor believing they will never understand. They may want to understand, and see how it burdens the pastor. They can recognize how sin puts a blanket on each ministry that is effected by imperfect choices. Do not discount them from being a source of help and encouragement! Most people are capable of genuinely being able to be compassionate in heart toward you. They can understand the behind the scenes knowledge that comes along with being closely involved in the work of the church and respect the need for keeping them in confidence. Part of bearing one another’s burdens is being humble enough to share. One worry is whether we are sharing our heart’s contents with those who are trustworthy and that is a legitimate concern. Time can only tell you if you can trust someone. Keeping burdens upon our shoulders because of fearing what other people may say or do (without giving them a chance) is just that, fear. “What if they tell other church members what we’ve talked about?” It is always wise to use discretion in specific matters and to keep information private if it is required. I feel like I have to make disclaimers all the time because in this world we live in. This message will not fit with every pastor/pastor’s wife and church staff situation out there. There are pastors and their wives who will continue to bear their burdens. 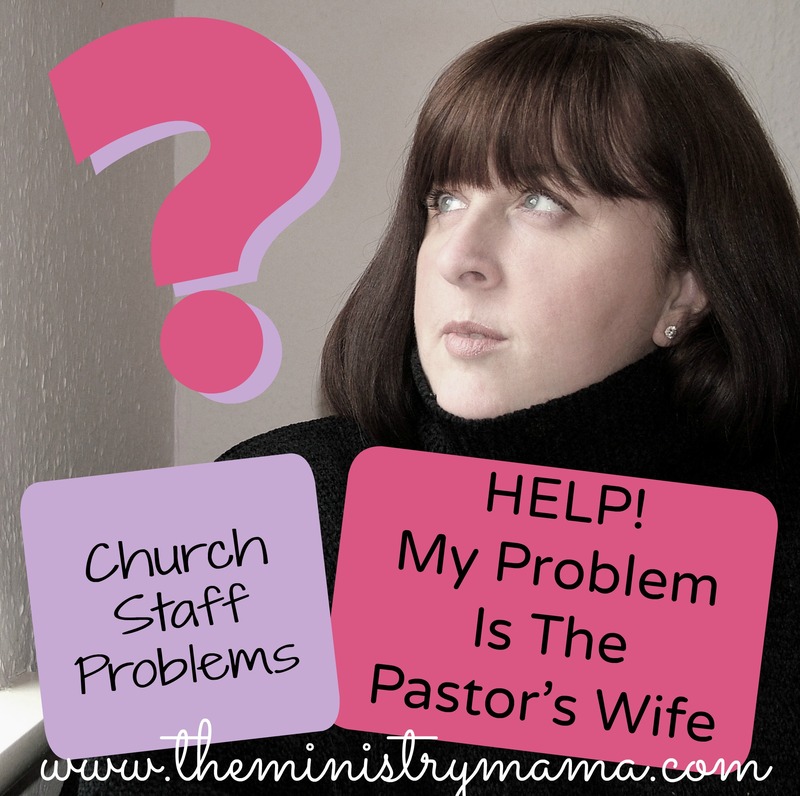 There are staff members who will still struggle to feel as if they cannot connect with their pastor/pastor’s wife. Above all, do as the hymn by Charles Tindley states, “Leave it there, leave it there. Take your burdens to the Lord and leave them there. If you trust and never doubt, He will surely bring you out. Take your burden to the Lord and leave it there.” God is our greatest burden-bearer. No amount of troubles overwhelm Him when we cast those cares upon His shoulders. Some of you will try to share their burdens with their staff and might be misunderstood or your “fears” may come true when a staff member unwisely shares your information with other people. For those situations I am truly sorry. You might be robbed of a blessing and I would suggest this: Keep praying. Be sensitive enough to share those burdens with someone you are close to so they can help you bear them (ministry friend, family member, etc.). Then, when the time is right and the Holy Spirit gives you a nudge, take a risk again somewhere in the future and share a burden. Share your prayer request, visions for the future of your church/ministries with your staff, and allow them to see the human part of your spirituality that needs God’s guidance. Taking a risk here and there is part of the growing process. You may just find that your church staff will do exactly what you need and help carry that load and strengthen you in the process. Remember: You found beneficial qualities in their lives or you would not have hired them! The possibility of sharing these matters may allow you to see God work in His mysterious ways to take care of these burdens… we never know what God will do when we join together in prayer for the problems going on in our church. We may actually see victories against sin, repair in relationships, and spiritual growth but the benefit is that they are shared victories and growth instead of just personal. Eliminate some of your stress by casting your cares upon the Lord and having enough confidence in your staff to be able to share matters that are on your heart. You need it, they need it, and Lord willing, growth will happen in the process. Your work and ministry is valuable, don’t bog yourself down if you can let others walk and work with you. I have had two different ladies reach out to me recently about a problem they have as a staff wife at their church…it is not the pay, or the time they have to spend with their husband, or knowing how to balance family and ministry. Their problem was their pastor’s wife. On two different occasions I asked in Facebook ministry groups about how to deal with this problem when you are on church staff. You would have thought I brought an elephant into the room. No response came as if I was like an immature child saying something embarrassing in front of a crowd of people, the crickets chirped loud and clear. No one wanted to answer how to deal with conflicts when you are on staff. Emily* expressed her pastor’s wife complained constantly of how bad her life was. When she tried to be encouraging, the lady always went back to her rut of a bad life. She and her husband both tried to reach out and serve in their church with a Christ-like spirit but it turned south very quickly after only a few months of serving in their church. Emily was so disappointed, hoping to have a nice lady be there to be a friend and ally in the work of the Lord but her hopes were crushed in the whirlwind of their ministry ending abruptly. Needless to say she left that ministry with no help or relationship with the pastor’s wife. Katherine* reached out to me privately asking about this topic. Katherine serves in a church where the pastor’s daughter and son-in-law are on staff so they are preferred over the other staff members, almost naturally. She believes that her pastor’s wife could be a great help to her in teaching her things about life and ministry but she simply chooses not to reach out to her. They have had a meeting about the problems and promises were made for things to get better but the pastor’s wife never changed. She often feels like a 5th wheel when the staff wives spend time together and wishes she had a friend to spend time with. Wow… with all the general praise of pastor’s wives there is the flipside. Women in general are their own sort of joy or force to be reckoned with. We have grand ideas of what WE should be in the ministry and these high expectations of how we should be, act like, look like, in the ministry fishbowl… but if I guess correctly, staff wives also have those grand ideas of their pastor’s wife. Life is real, people are real, pastor’s wives fit in the categories of every other group of people, as sinners. Personalities play a role in who they are, their experiences and opinions drive what they do, and their spirituality is reflected in who they are and how they treat others. 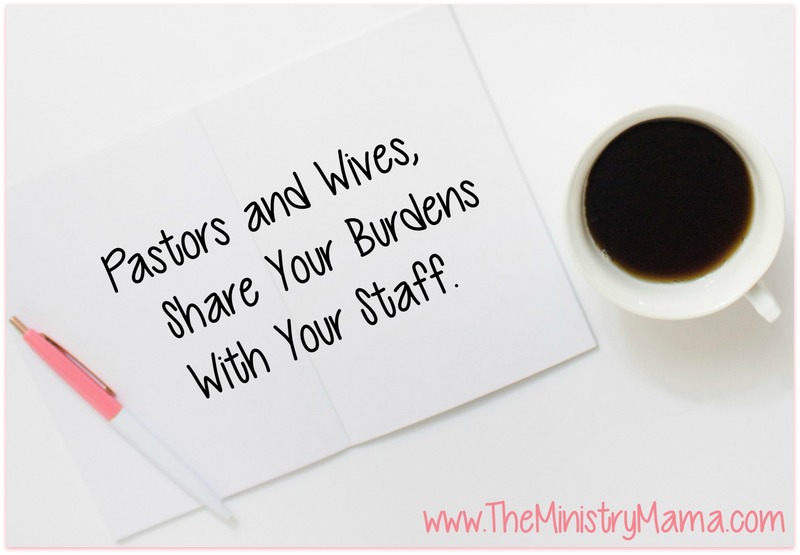 Their desire to serve and whether they are motivated or tired of their ministry is reflected in how they treat any other wife that is married to a man on staff. If you are having problems with your pastor’s wife, as a church staff wife here are some recommendations given to me personally by some people who finally did want to tackle the elephant in the room. I took large suggestions and broke them down into mind-sized pieces. Give her the benefit of the doubt. In other words, cut her a bit of slack. Look at her life and the amount of things that may be in her schedule and try to have some understanding to why things may not be peachy. Evaluate whether the problems you perceive are because of temporary stress or a recurring issue. Do right, no matter how she treats you. Proverbs 25:21-22 If thine enemy be hungry, give him bread to eat; and if he be thirsty, give him water to drink: For thou shalt heap coals of fire upon his head, and the Lord shall reward thee. Look for opportunities to be a bigger blessing to her. It is more blessed to give than to receive, right? If you keep running into conflict or problems, then seek to maybe help with the unnoticed things, doing a job that helps her without her realizing it. Something I have done for my pastor’s wife is trying to keep our church kitchen clean as she used to do it every week, so that she can be free to do other things. Another idea is to volunteer to run an errand for her and pick up some things from the store when she is working on a ladies project or church meal. Deal with her in humility. Some people would rather ignore you than deal with confrontation or problems. This all boils down to pride. If your pastor’s wife struggles with pride, then deal with her in humility with God’s help. Remember, you ultimately serve the Lord. While who you and your husband serve with may not accept you in the way you like, focus on the ministries you have been assigned to and do them with all your might. There is a way that we can please the Lord and serve peacefully and quietly without causing problems even though situations may not be ideal. Think before you react. There are times where things may need to be discussed, other times it may be appropriate to sit and wait out the stress and see what happens next. There are other times where you may be tempted to give a piece of your mind, but there is no angry fight worth losing your testimony over. If in doubt, wait. Also, be willing to follow God’s leading if He prompts you to ask for forgiveness if you have caused a problem between you and her, no matter how you may think she will react. Zip your lip at the right times. While your heart my be discouraged tremendously and you may need a listening ear, be wise not to bear those types of burdens on church members or even your own children. Speak with trusted friends or family members outside your church that will give you good counsel about your struggles and will keep your concerns in confidence. Pray the Lord will be able to tear down the walls between you and your pastor’s wife or pray that He will strengthen you to endure an uncomfortable situation. Trust that if the Lord brought you to a particular ministry, there is a reason why you are there doing His work. You can still learn from her even if she does not open the door to you completely. James 1:3,4 Knowing this, that the trying of your faith worketh patience. But let patience have her perfect work, that ye may be perfect and entire, wanting nothing. Ask the Lord for a friend in ministry that will help you. I bet you did not know that one of my greatest ministry mentors is not a pastor’s wife at all! She loves ministry and has served in church for a long time, her son also serves in a church ministry, but she does not hold the title “pastor’s wife.” I love her helpfulness and Biblical insight to ministry life. God will give you someone to be able to answer your questions and hear your heart’s concerns, all you need to do is ASK! Plus, there is no greater person than Him that will guide and comfort you no matter the problems you face. God is there. He knows. If you have any advice for staff ladies having problems with their pastor’s wife, please leave it in the comments below.